The Gers started brightly but were left rattled after Josie Giard opened the scoring for Celtic after only 12 minutes. Kelly Clark and Natalie Ross then added a second and a third in quick succession to put the game just about beyond the home sides reach before the 20-minute mark. Rangers missed the chance to get one back just before the break after a Claire Gemmell’s penalty was brilliantly saved by Celtic’s Megan Cunningham – both keepers made some excellent stops throughout the match. Celtic sealed the three points in the 55th minute as Kathleen McGovern added a fourth goal for the away side. Rangers got a consolation goal with almost the last kick of the game through a Chantelle Brown header. The Light Blues in fact started the game on the front foot, not allowing the away side to get into the game in the first few minutes. Celtic came forward on a few counter attacks but neither side created many clear chances in the first ten minutes. The away then began to turn the screw. 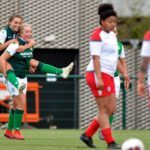 Celtic opened scoring on 12 minutes after a long throw in from Keeva Keenan caused a lot of problems for the home side’s defence, who couldn’t properly clear their lines. The ball then found its way to Gaird who bent shot from just outside the box past the diving Jade Baillie to give her side the lead. Rangers were rattled after the goal and Celtic continued to press. The second goal followed four minutes later when a well delivered corner was swung into the box and headed home by Clark in a tight and crowded penalty area. The third goal was controversial. After a looping ball, Baillie was clattered into after coming out of her box to win the ball. Rangers appealed for a free kick but as they were doing that the ball found its way to Ross who looped the ball over the grounded keeper and into an empty net from over 30 yards out. The Light Blues keeper recovered to pull off an excellent stop in the 27th minute to deny Celtic a fourth. But Rangers really struggled to cope with Celtic’s rehearsed set pieces which created a chance on most occasions in the first half. A Celtic handball then resulted in Rangers being handed a chance back into the game on 43 minutes. 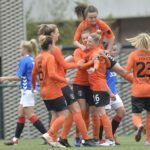 The Gers captain stepped up to take, but her penalty was brilliantly saved by the Celtic keeper before Chantelle Brown smacked the resulting rebound off the post. Early in the second half, Brown threated early for Rangers when shot from a tight angle forced a diving save from the away sides’ keeper. But once again Celtic dominated in the early stages of the half and created a couple of chances. A shot from Sarah Ewens was well saved again by the Rangers keeper before the rebound was fired wide by McGovern. Then came the decisive fourth goal ten minutes into the second half, through a Gaird header. There was no way back for the home side after that. The Light Blues matched Celtic more in the second half but didn’t often penetrate the away side’s back line resulting in a frustrating afternoon. Rangers did get a late goal back though, which they probably deserved after a lot of pressure on the Celtic defence. Brown headed in the consolation. 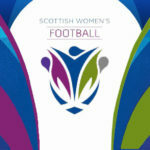 Amy McDonald’s side must now wait a fortnight to try get back to winning ways when they face high flying Glasgow City on the April 14 in the SWPL Cup semi-finals. SUBS NOT USED: Ramsey, Donnelly, Watson.